Athletes from Taiwan compete at the Olympics under the name of a make-believe country: Chinese Taipei. They march behind an imaginary national flag and, if they win a gold medal, hear an “alternate national anthem” being played. China’s authoritarian government has viewed Taiwan as a renegade province since the two separated in the 1949 civil war. The International Olympic Committee backs China, which will host the 2022 Winter Olympics after spending $40 billion on the 2008 Summer Olympics in Beijing. “The agreement remains unchanged and fully applicable,” the IOC said. Taiwan’s athletes are caught in the middle. Dozens protested Wednesday, fearing they could lose their chance to participate in the Olympics. Jacqueline Yi-ting Shen, the secretary general of the Chinese Taipei Olympic Committee, declined to comment for this article. But she spoke about Taiwan’s predicament in an interview with the AP at the Asian Games in August. “This gives us a chance to compete and make our strength known internationally, so we accept the pity that we have to compete under the name of Chinese Taipei,” Shen said. Ma Xiaoguang, a spokesman for China’s Taiwan Affairs Office, told a news conference this month that Taiwan was using the name issue to “politicize” sports. He said the referendum would damage Taiwan’s interests but gave no details of measures Beijing might take. Earlier, China warned that Taiwan would “swallow its own bitter fruit” over the referendum issue. Taiwan’s ruling party, the independence-leaning Democratic Progressive Party led by President Tsai Ing-wen, has remained largely silent on the name change. China has thwarted Taiwan’s every move to assert its independence, even in the sporting sphere. Earlier this year, Taiwan lost the right to hold the East Asian Youth Games, under reported pressure from China. Taiwan held the Summer University Games last year with about 7,500 athletes. China skipped the opening ceremony, but competed in the events. Athletes from Argentina unfurled Taiwan’s real flag at the closing ceremony, waving an independence symbol that Taiwan athletes are forbidden from displaying. China has warned international airlines and hotels not to use the word “Taiwan” on maps or other material. 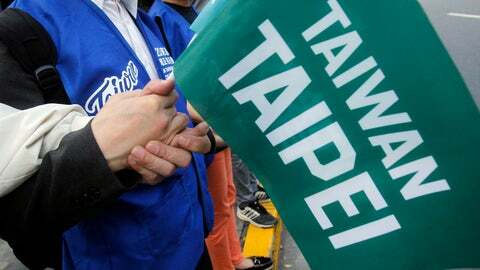 The referendum needs one-quarter of Taiwan’s 19 million voters to be approved. Liao, the political scientist, doubts it will reach that threshold. If it does, the Chinese Taipei Olympic Committee is likely to ask its membership what to do. It risks IOC censure if it moves ahead. The IOC is reported to have warned it at least three times not to proceed. If it backs down, it’s thwarting the democratic will of Taiwan voters. Taiwan participated in the 1972 games as the Republic of China. It boycotted the next several after its United Nations seat was handed to China, returning in 1984 after submitting to the name change and China’s rising clout. Despite the roadblocks, the island of 24 million remains a regional power and placed seventh in the recent Asian Games, fielding a delegation of 550 and boasting stars like badminton’s No. 1-ranked woman Tai Tzu-ying.